Matthews Calls Limbaugh 'Walrus Underwater': Was This a Vulgar Reference? CRITICAL UPDATES AT END OF POST including Matthews saying "Bush regime" in 2002. 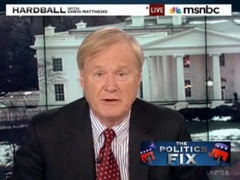 Chris Matthews on Friday referred to conservative talk radio host Rush Limbaugh as a walrus underwater. Chatting with guests Chuck Todd and Andrew Ross Sorkin about Limbaugh's recent comments concerning President Obama, Matthews quipped, "And this guy, this walrus underwater, makes fun of this administration, calling it a 'regime.'" Was this a vulgar reference to a walrus video that went somewhat viral on YouTube last year? CHRIS MATTHEWS, HOST: OK, let`s go to the politics pure and simple here, Chuck. Here`s the president -- I want you to respond to this. Here he is with Harry Smith this morning on CBS "Morning News" going over his enemies list, basically. I`ve never seen a president -- well, not since Nixon fought with Dan Rather have we really seen kind of rivalry where the president cites by names his critics. And they are his critics, in all fairness. Let`s listen. OBAMA: ... it`s pretty apparent, and it`s troublesome. MATTHEWS: Well, we`ve got the response to that. Here`s -- here`s -- you know, this guy is no frail flower, if you will. He doesn`t hide. Here`s what Rush Limbaugh said to "The D.C. Examiner" today. Quote, "Never in my life have I seen a regime like this, governing against the will of the people purposely -- purposely. I have never seen the media so supportive of a regime amassing so much power, and I`ve never known so many people who literally fear for the future." This is to me -- I`ll just give you a little editorial (INAUDIBLE) I`ve never seen language like this in the American press, referring to an elected representative government, elected in a totally fair, democratic, American election -- we will have another one in November, we`ll have another one for president in a couple years -- fair, free, and wonderful democracy we have in this country. And this guy, this walrus underwater, makes fun of this administration, calling it a "regime." We know that word, "regime." It was used by recent presidents (INAUDIBLE) by George Bush, "regime change." You go to war with regimes. Regimes are tyrannies. They`re juntas. They`re military coups. The use of the word "regime" in American political parlance is unacceptable, and someone should tell the walrus to stop using it. CHUCK TODD: Well, I`ll say this. You know, which has come first, though, in this? MATTHEWS: I don`t even think Joe McCarthy ever called this government a "regime." TODD: ... he`s talking about opinion media -- that the entire noise that he sees here in Washington -- and so you wonder how much of it -- you know, is he bringing more attention to it than it deserves, as well? Interesting. But what was the "walrus underwater" reference? Well, a few months ago, a video was posted on YouTube of a walrus performing a sexual act on itself. Was this what Matthews was referring to? What else could it have been? A Google search identified no slang references to walruses other than the obviously famous Beatles' one. Maybe Matthews should correct himself Monday, but don't hold your breath. *****Update: Olbermann wasn't the only person on MSNBC to refer to the Bush administration as a regime. In George Bush`s regime only one million jobs have been created in his whole eight years, net, and in President Clinton`s 23 million. The Bush regime was still in power, Bush, Cheney, Rummy, the whole crowd was still there. Well, I mean, Rush`s statements kind of darkly suggested that the liberal media, expressing their dissatisfaction with the Bush regime, was emboldening other leaders and other countries. And if you look at our Web site, Chris, VoteNader.org, you'll see how we take apart the Bush regime in ways that the Democrats should emulate, if they had the nerve. SEN. JOHN KERRY (D), MASSACHUSSETTS: What we need now is not just a regime change in Saddam Hussein and Iraq but we need a regime change in the United States. SCARBOROUGH: Now that guy was obviously playing - I mean Kerry's a smart guy, obviously playing to New England Democrats but how is that going to play on one of your focus groups next year that clip right there comparing the regime of George Bush to the regime of Saddam Hussein? LUNTZ: Not does that not play with mainstream America but even with mainstream Democrats who are watching, people who voted for Al Gore, more than half of them are going to hear that clip and it's going to make them cringe. It's too strong actually equating a regime in America with a regime in Iraq, the fact that we are a democracy and they obviously were not, are not and we hope that they may be at some point in the future. That was targeted specifically at raising money from only the most left wing Democrats but here's the problem. He could end up winning the battle, which is the Democratic nomination. With quotes like that and that anger, with quotes like that he'll never become President of the United States. SCARBOROUGH: It's going to kill him with the swing voters. It's got to kill him with the swing voters that you focus on every four years around the presidential election. So is the Bush administration using the, using the terror war to curb civil liberties here at home? Let's go to the Reverend Al Sharpton. Reverend Sharpton, what do you make of this letter and this panoply of the left condemning the Bush regime? MATTHEWS: What about the walrus, walrus underwater, Rush Limbaugh? What do you make of a guy calling this a regime today to the D.C. newspaper? He calls this government a regime. I have never heard that language. This is not Stalin. This isn`t some junta. He was elected the same way, and a Republican would be elected. And next time, if a Republican is elected, it will be a Republican administration. It won`t be a regime. We don`t have regimes in this country. We have Franklin Roosevelt. We have Truman. We have Ronald Reagan. We have administrations. To use that word regime suggests to me, just kill the Nazis, regime change. More part of this neo-con lingo. MATTHEWS: What about waiving the flag, the "don`t tread on me" flag, the Gadsden Flag, that was rabble-rousing. CORN: They appeared before an audience that was shouting Nazis, referring to the Democrats and Obama, and they didn`t stop it. They didn`t say don`t do that. So they actually got the permit for the crowd to appear and do that. It seems at least it`s implied acceptance. BACON: They should condemn the rhetoric. I`m not sure John Boehner is the leader of the Tea -- if John Boehner condemned it tomorrow, do you think these things would stop? MATTHEWS: Let me follow you up there, Perry, follow you up on the post. Why do you think the president -- let`s spread this around a bit -- do you think he is -- we had this Michele Bachmann, who is a figure on the right. She was saying that Nancy Pelosi, by walking past all the protesters during the vote over health care, was stirring them up, by creating kind of a civil rights rally look to it, that would trigger them. Do you buy that? Did that trigger the crowd up? BACON: I don`t think that triggered the crowd up. The imagery with her and John Lewis was, I think, a design, in some ways, to say we are standing together. MATTHEWS: Was it meant to be provocative? BACON: I don`t think it was meant to be provocative. I wouldn`t agree with that at all. Yes. MATTHEWS: What are about the president zeroing in -- the new phrase is calling out, going after Rush Limbaugh and Glenn Beck, the fact that he is using the names of basically personalities, not office holders? Is that something you think is to provoke more trouble? Does he want them to hate him? Does he want them to be the chief haters? I`m trying to be open minded here. You`re on the liberal side. Why is the president naming names? CORN: Listen, because we all know who the 80 pound gorillas or elephants are in the room. He was acknowledging reality. MATTHEWS: I think it`s walrus in this case. RUSH LIMBAUGH (radio talk show host): (From videotape.) This will play right into Obama's hands -- humanitarian, compassionate. They'll use this to burnish their, shall we say, credibility with the black community, the both light-skinned and dark-skinned black community in this country. It's made to order for him. That's why he couldn't wait to get out there -- could not wait to get out there. MATTHEWS: What do you make of that? I mean, I've compared him -- he talks like he's a walrus underwater. But yet the words are worse than the sound. What do you make of that kind of commentary, stirring the pot on race in this country, on complexion within the black community, the whole thing, using this tragedy to do that? For the record, this was six days after the Huffington Post published the viral YouTube walrus video (link withheld for decency). The video in question was posted at YouTube on March 15, 2009. Three months later, on June 10, Matthews also used this expression: "Doug, it`s not too cartoonish to describe Rush Limbaugh as sort of a walrus underwater." According to LexisNexis, these are the only times Matthews has used this phrase to describe Limbaugh, all subsequent to the walrus video's posting on YouTube. It appears that Matthews has suffered a major memory loss. I don't have the facilities to search for every utterance of Joe McCarthy, but a look at more recent times reveals many, many, many examples of the phrase "Bush regime." In fact, a search of the Nexis database for "Bush regime" yields 6,769 examples from January 20, 2001 to the present.